“Vorsprung durch Technik”- “Progress through technology” is the core belief that drives the development of Audi and delivers an utmost exhilarating driving experience! Trust professionals that truly understand the essence of a fine European automobile and will care for and keep it running optimally! The iAUTOHAUS BOSCH Authorized Service and Repair Center houses the latest high-tech diagnostic tools, Certified Master Technicians as well as knowledgeable and friendly Service Advisors that will assist you with all your automotive needs. We use quality Audi or OEM parts and provide a 24-month 24,000-mile warranty on parts and labor for added peace-of-mind. Enjoy a clean and comfortable waiting area and free shuttle service as well as a complimentary hand wash after service completion! From basic maintenance to complex repairs, we will provide the ultimate level of care for your Audi. We can service all model lineups- A, Q as well the entire lineup of S models! Ready to trade in your Audi for a newer or different model or perhaps a complete change of make? Visit of Sales department to see the beautiful inventory all housed in our indoor showroom. New inventory arrives weekly and we are certain you will find the next car of dreams at an affordable price. We look forward to serving you- welcome to iAUTOHAUS! 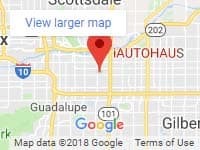 When you are ready to have our Audi serviced by iAUTOHAUS We are conveniently located right next to the Tempe, Scottsdale border on Broadway road. We are just off of the 101 Freeway. We are so close to the freeway that your Audi won’t even be in third gear when you find our parking lot. Come experience the difference our service makes.